Coastal Storms offers students and professionals in the field a comprehensive overview and groundbreaking text that is specifically devoted to the analysis of coastal storms. Based on the most recent knowledge and contributions from leading researchers, the text examines coastal storms’ processes and characteristics, the main hazards (such as overwash, inundation and flooding, erosion, structures overtopping), and how to monitor and model storms. The authors include information on the most advanced innovations in forecasting, prediction, and early warning, which serves as a foundation for accurate risk evaluation and developing adequate coastal indicators and management options. 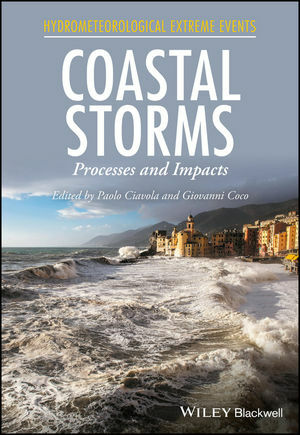 Coastal Storms is a compilation of scientific and policy-related knowledge related to climate-related extreme events. The authors are internationally recognized experts and their work reflects the most recent science and policy advances in the field. Paolo Ciavola is an Associate Professor of Geomorphology at the University of Ferrara, where he teaches courses of geomorphology and coastal risk. He holds an MSc in Geology from the University of Bologna (Italy) and a PhD in Marine Sciences from the University of Algarve (Portugal). He has an interest in coastal processes and risk from extreme storms.?? Giovanni Coco is an Associate Professor in the School of Environment at the University of Auckland, where he teaches courses on modelling environmental systems. He holds a PhD in Marine Studies from the University of Plymouth (UK). His interests range from coastal processes to machine learning and pattern formation.? ?